Painter, draughtsman and collector, part of a Flemish family of artists whose members of at least six generations were artists, active from the late 15th century to the 17th. The family was foinded by Jan van Coninxloo I ( fl 1490). Gillis van Coninxloo (in fact Gillis van Coninxloo III) was the son of Jan van Coninxloo II. 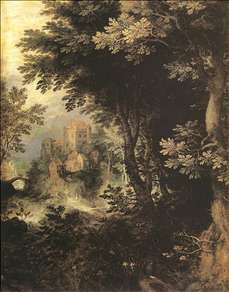 Van Mander, a contemporary of Gillis van Coninxloo III, wrote in 1604: He is, as far as I know, the best landscape painter of his time; his style is now frequently imitated in Holland. His works works show the transition from Mannerist to early Baroque landscape. Coninxloo studied under, among others, Pieter Coecke van Aelst, a painter of the Antwerp school of Mannerism. After a period of travel in France, he returned to Antwerp in 1570 and was made a member of the painters guild. He left his home again in 1585 to escape religious persecution and stayed at Frankenthal in the Palatinate until 1595, when he settled in Amsterdam. InFrankenthal he had a decisive influence on a group of emigr Flemish landscape painters now known as the Frankenthal school. Among its most important exponents are Pieter Schoubroeck (c. 1570-1607) and Anthonie Mirou. The development of Coninxloo s style is often described in three periods that somewhat correspond with his residence in Antwerp (1570-88), Frankenthal (1588-95), and Amsterdam (1595-1606). His earlier works are deliberately composed landscape fantasies reflecting the influence of the Italianate Flemish landscapist Paul Bril. Coninxloo s later landscapes are more naturalistic and are characterized by their blending of colour into a harmonious atmospheric tone. Gillis s contributions to the development of Dutch and Flemish landscape painting were of decisive importance. More than any other artist, he represented the heroic landscape, an interpretation of nature based on reality but with a tendency to idealize the scenery, thus making the whole sublime. While his predecessors painted vast panoramic landscapes, Gillis III rendered self-contained glimpses of nature and created a sense of unity between man and nature as well as between the landscape and the viewer. A similar notion was being developed simultaneously in Italy by such artists of Netherlandish origin as Lodewijk Toeput and Paolo Fiammingo. Van Coninxloo, who never actually visited Italy, probably came to know this new style through prints by Cornelis Cort after Girolamo Muziano, which were then circulating throughout the Netherlands. 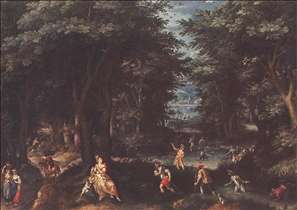 Other northern artists such as Jan Brueghel the Elder and Paul Bril achieved similar results at the same time or even before. Their contribution to the development of forest landscapes may therefore be considered to be at least as important as that of Gillis van Coninxloo, if not more so. 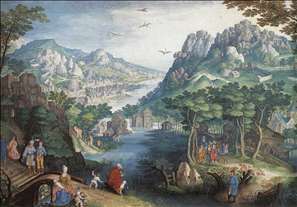 See more details about "Landscape"
See more details about "Landscape with Leto and Peasants of Lykia"
See more details about "Mountain Landscape with River Valley and the Prophet Hosea"